Logan Hagege, Josh Elliott and Glenn Dean have quickly become the next generation of Western artists and they are doing it together, one painting at a time. In the summer of 2006, Los Angeles-based painter Glenn Dean moved to Santa Fe, New Mexico, in an attempt to surround himself with the Southwestern landscape and culture for which he had developed such a passion. Solitary moments in the studio soon got him thinking of friends – new and old – and he organized a painting trip in and around Northern New Mexico for himself and several other artists. After the last of the winter snows melted from the branches of the nearby aspens and junipers and the gentle crispness of the spring air and legendary Santa Fe light returned the following year, Dean was joined by fellow artists Logan Maxwell Hagege, Josh Elliott, Jeremy Lipking, and Ernesto Nemesio for the trip. The five, using Dean’s home as a base, crammed inside a rented Chevrolet Cobalt and made it their mission for the coming days to drive around the blue highways and dusty back roads of the region. They sought places to paint that appealed to the group, or looked for areas painted many, many years ago by their painting heroes such as Hennings, Blumenschein and Higgins, and then returned to their respective studios to produce the work. Traveling to Taos, the Taos Pueblo, Abiquiu, Georgia O’Keeffe’s Ghost Ranch, and the White Rock Overlook perched beautifully above the Rio Grande River, allowed these five artists to form a close friendship that has remained with them ever since. This month Medicine Man Gallery in Tucson, Arizona has organized an exhibition titled Young Guns featuring the work of Hagege, Dean, and Elliott. In the six-year span between this first painting trip and the current show, the three artists have remained in close touch with one another, gone on several more excursions together and provided endless hours of counseling and critiquing, inspiring and motivating one another. It’s the stuff of which art books are written. 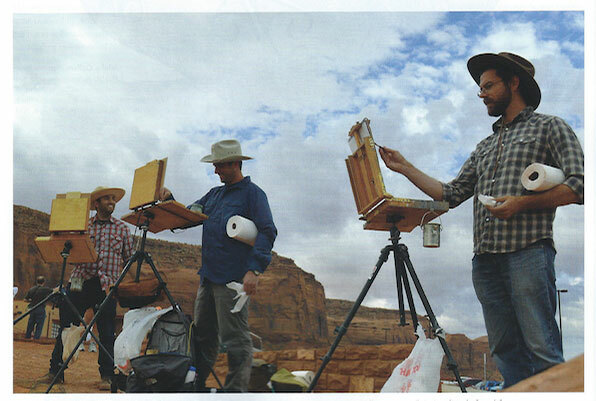 From left: Logan Maxwell, Josh Elliott and Glenn Dean painting on location in Monument Valley, Arizona. Painting directly from life is one of the things that unites these three Western artists. 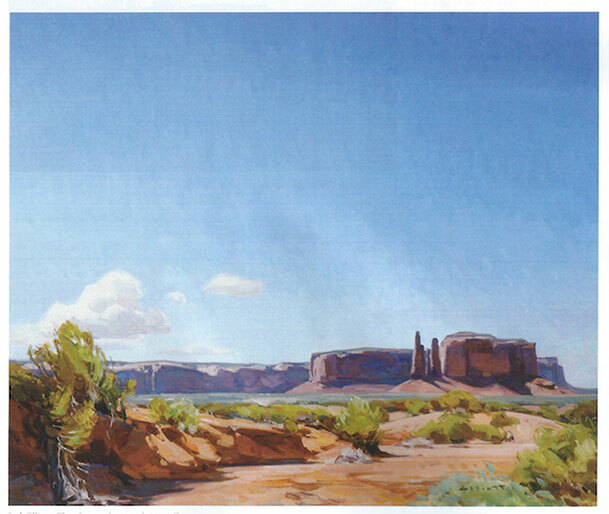 For this new exhibition in Tucson, the three traveled to the Vermillion Cliffs and Monument Valley in Arizona to paint works for the show. As is the case in all of these painting excursions, the three woke up early, painted nearly the entire day – on location – just like their painting forefathers, and then spent the evening eating, drinking and sharing stories of the day. And, while human nature tend toward competitiveness; these three view that aspect of their personal and professional relationships on a completely different level. Logan Maxwell Hagege, Three Sisters, oil on inen, 30"x30"
What this current exhibition will show is how three like-minded artists approach the same subject matter in a completely different fashion. For the first time ever, these artists have also created triptychs for the show, two works of art, each made up of three separate panels, one painted by each artist. 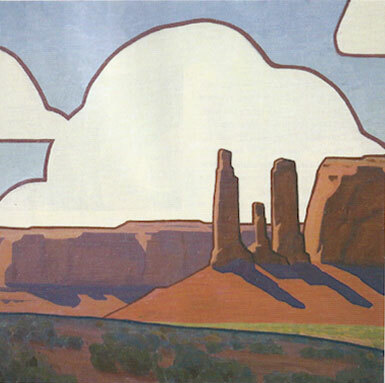 One triptych is made up of three panels depicting the same scene in Monument Valley – although young, the three have already developed very significant signature styles – and the other is a landscape changing from light to dark. The one thing that inextricably ties these three together is also one of the most basic tenets when it comes to painting – a love affair with painting what is in front of you, on location, directly form life. While the three have different painting styles, they all cling to this fundamental truth in oil painting. Josh Elliott, Three Sisters, oil on panel, 20"x24"
Elliott, who is from Montana, admires Dean’s abilities as well. Looming over this, vast and beautiful and expansive, ominous and accepting and enduring is the land, the West itself. Still and endless source of inspiration, a geographical space that is as rich and vibrant as its own long and tumultuous history, the landscapes of the West continue to inspire artists just as they did hundreds of years ago. 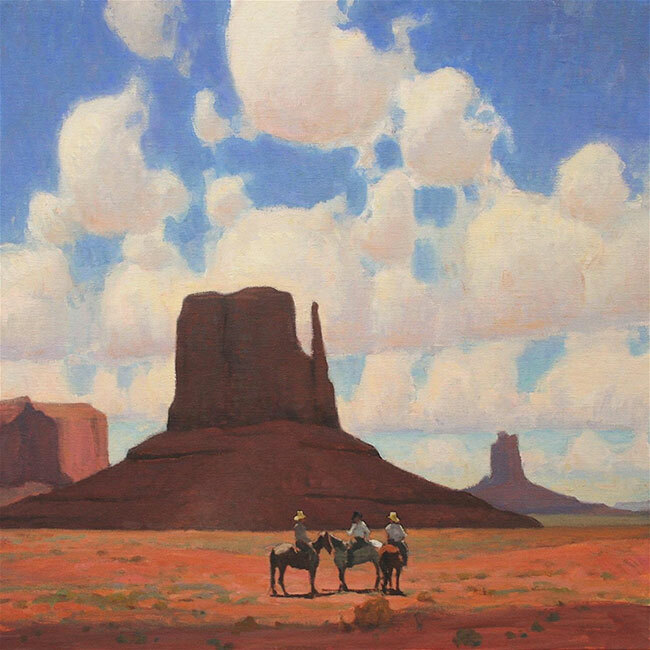 Glenn Dean, Valley Riders, oil on canvas, 42"x42"
“It’s always the West, always has been since I first saw it,” says Dean. “It’s one of those subject that I am determined to spend my life trying to do it justice. The West has so many quiet places we don’t really honor in our own selves. People sometimes see the desert as a wasteland but they’re not really seeing it. They’re not out there painting, really studying it. It’s a special place. That’s what I have to say, and I think it’s worth a lot of art. It should be honored through art. That’s what it deserves." Young Guns – new work by Logan Maxwell Hagege, Josh Elliott and Glenn Dean – is at Mark Sublette Medicine Man Gallery, 6872 E. Sunrise Drive, Tucson Arizona, 85750, February 8 through March 7. For details, call (520) 722-7798.